I’m not gonna lie: I’m getting psyched for fall!! PUMPKIN! CINNAMON! PUMPKIN! Wait, what? Sure, I’m LOVING the end of summer — I’ve finally been here for a whole month uninterrupted by travel (for like 36 more hours), and have totally settled into the ride bikes/drink coffee/meet friends/go swimming/hiking/biking groove of things. It’s awesome! But so is using a comforter when you sleep, and wearing socks and sweaters, and not arriving to every destination covered in sweat. Also: fall food. Duh. I haven’t touched my stash of tea in MONTHS — I drink one hot bevvy per day, and we all know it’s coffee. But the promise of cold mornings/evenings, complete with tea and soup and BAKED OATMEAL WITH FALL DELIGHT (that’s a thing, I say so) is so close. SO so close. I’M BACK. With pb in spoon/mouth/belly. 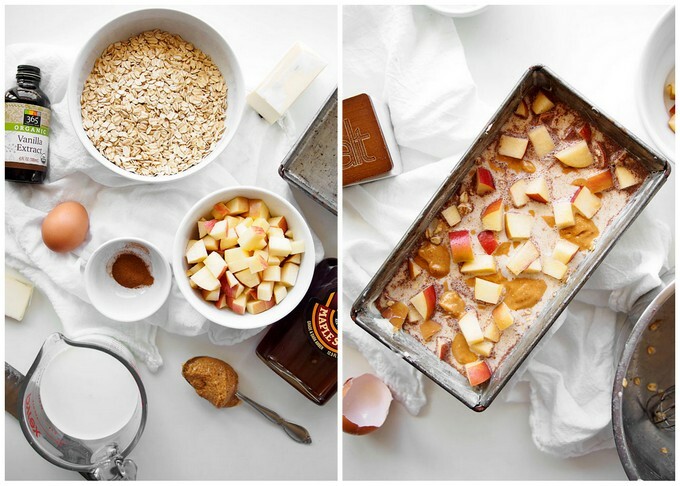 Baked oatmeal is definitely one of my favorite things to have on hand for breakfast throughout the week. It’s so easy to throw together, endlessly customizable, and (when you’re just feeding yourself) lasts through the week. Plus, you can smother it in half and half when nobody (or everybody) is looking and feel like a real winner! Preheat the oven to 350F. Use the butter to grease an 8×8″ baking dish, or a 9″ loaf tin. Combine the maple syrup, salt, milk, egg, and vanilla. Use a whisk to mix until the egg is totally combined and the mixture is smooth. 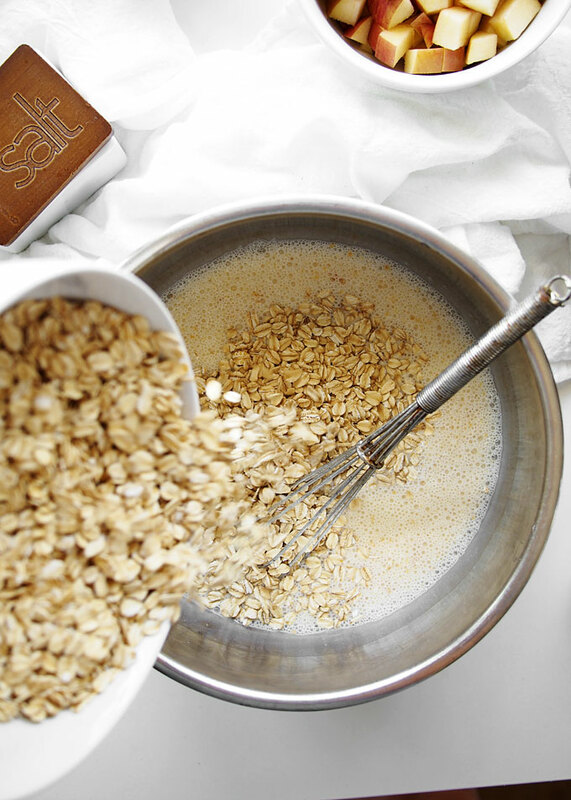 In a separate bowl, mix together the oats and cinnamon. Once mixed, add to the wet mixture and stir to combine. Fold in 2/3 of the chopped apple, and half of the peanut butter. Pour into the prepared dish, and drop the remaining peanut butter on top, along with the remaining apples. Bake for 45-50 minutes. The mixture should be set and beginning to turn golden on top. Serve with half & half or more peanut butter. 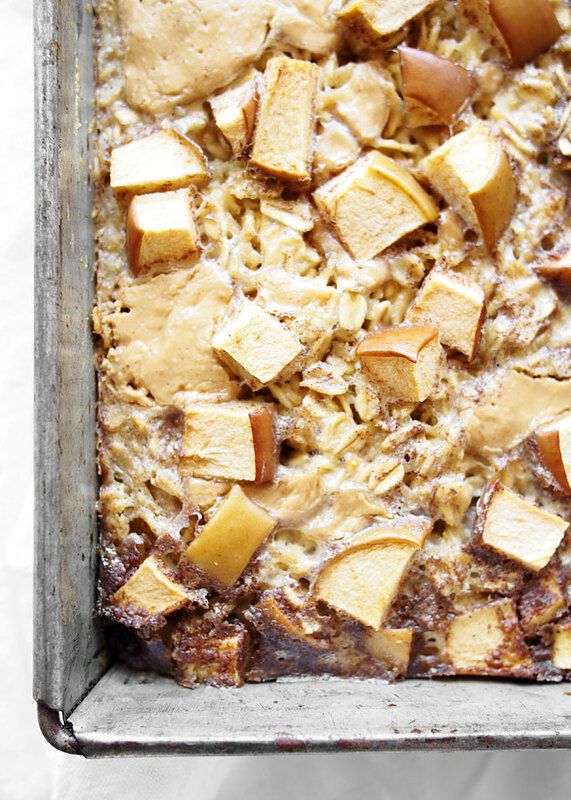 I definitely need to make this for breakfast this week.. never made an oatmeal bake before and it looks like the perfect way to start the day. This looks wonderful. I’ve never baked oatmeal before, so I’ll have to give it a shot. I’ve seen a lot of “overnight oats” but I’m not sure about eating it cold. It just sounds wrong to me. This one is up my alley! 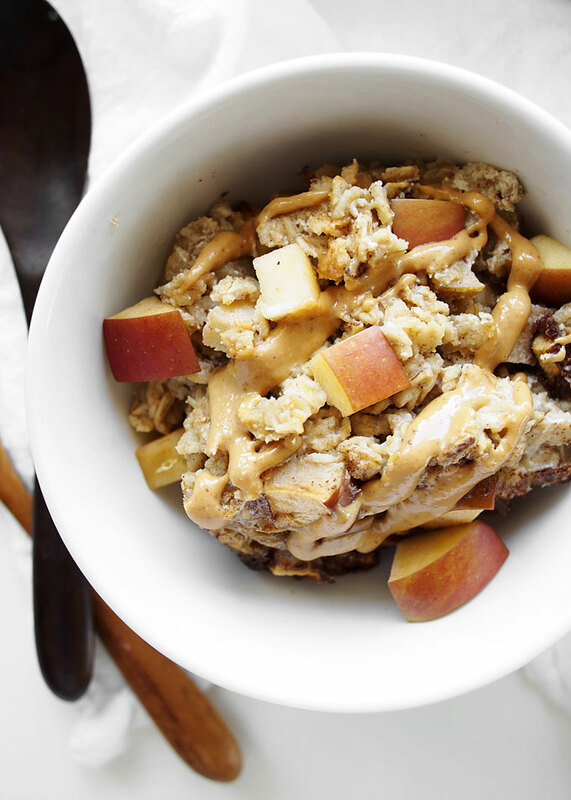 I love the combination of creamy peanut butter with sweet apples and chewy oats! 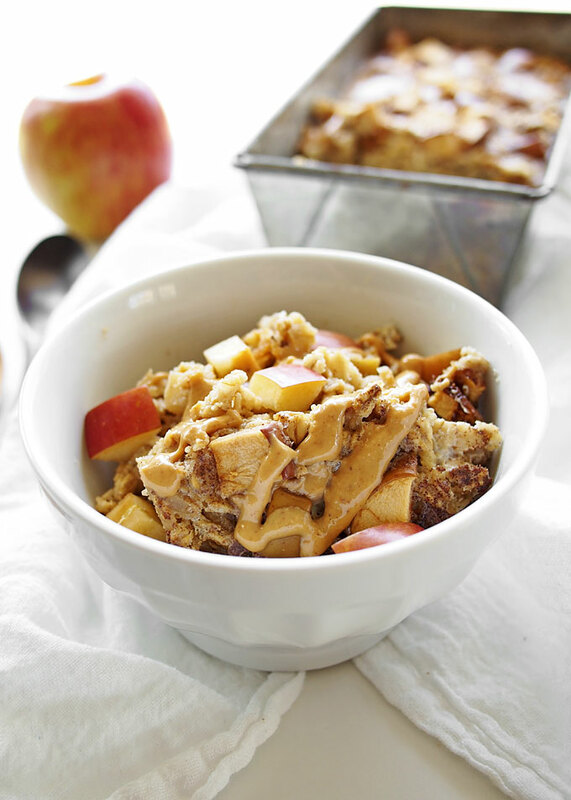 I made my version of baked Peanut Butter Apple Oats, a vegan version of it and it was delicious. Your recipe looks delicious, this is a real comfort food in these colder months 🙂 I will smother it with lots of P&B! !